Mount Kilimanjaro rises majestically from a rolling plain close to the Indian Ocean from hot savanna to a barren and frigid 3-1/2 mile high peak. It's the highest mountain in Africa and one of the largest free standing mountains in the world. Climbing Kilimanjaro is a must-do challenge for almost every trekker and mountaineer in the world. Kilimanjaro National Park takes in the area above the 8,850 feet, or 2,700 meters, on the mountain. It includes the moorland and highland zones, Shira Plateau, Kibo and Mawenzi peaks. 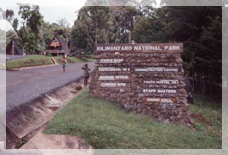 In addition, the Park has six corridors or rights of way through the Kilimanjaro Forest Reserve. The Forest Reserve, which is also a Game Reserve, was established in 1921; the Park was established in 1973 and officially opened in 1977. Even though you can climb throughout the year, January, February and September are the best months, with July, August, November and December also being good. Equatorial to arctic conditions are present on Kilimanjaro. The range begins with the warm, dry plains with average temperatures of 85°F, ascends through a wide belt of wet tropical forest, through zones with generally decreasing temperatures and rainfall, to the summit where there is permanent ice and below freezing temperatures. The rainiest period is March to June. The fact that most months of the year have so few rainy days makes it possible to climb in relatively good conditions year round. During the rainy period of March to May, clouds tend to pile up and over the summit, dropping snow on top and rain at the base. Visibility can be limited by cloud cover even when no rain falls. The temperature at this time of year is relatively warm. The dry season, beginning in late June and through July can be very cold at night, but usually is clear of clouds. August and September are also cool and can have completely clear days, but usually a dripping cloud belt girdles the mountain above the forest and moorland. The summit can be totally clear and the successful climber looks down on a vast sea of clouds with distant mountain peaks poking through like islands. The shorter rainy period of October to December often has thunderstorms that pass over the mountain, dropping rain as they go. Typically the clouds disappear in the evening, leaving nights and mornings clear with excellent visibility. January and February are usually dry, warm and clear with brief rain showers which make for good climbing conditions. Kilimanjaro towers above the Great Rift Valley, possible birthplace of humankind and the site of the Leakey's research in the Olduvai Gorge. This gives Kilimanjaro an awesome mystique. One can imagine the mountain towering above our ancestors, making an early, continual impression on the species. When you walk the mountain, you'll probably encounter some odd, purposeful arrangements of stone. Your guides will claim to not know what they mean. Perhaps they don't.